With an international Food Hall and restaurants around the globe, the celebrity chef continues to conquer the culinary world. Before international food markets and culinary halls starting popping up throughout the city, the Todd English Food Hall opened in The Plaza, New York’s most iconic hotel. With it, it brought a unique, unprecedented approach to dining in New York City, and more of the world’s best food to one of the world’s best hotels. Of course a concept this grand couldn’t be brought to us by just any chef. It required the experience and prestige unique to one man—the chef named the James Beard Foundation’s National Rising Star Chef in 1991 and Bon Appetit’s Restaurateur of the Year a decade later; the owner of restaurants and brands spanning the globe, including Olives from Vegas to Abu Dhabi, Figs from Boston to Palm Beach and Kuwait, and culinary concepts at Walt Disney World, on Cunard’s Queen Mary 2, and in three major U.S. airports. 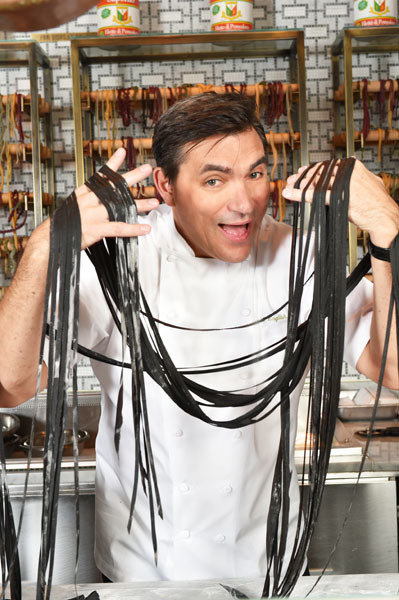 This man, of course, is Chef Todd English, and he proved—most definitely—to be the right man for the job. To make just one restaurant in New York a lasting success is a challenge to say the least; to build a culinary empire around the globe and curate a food hall with nine diverse food stations that lives up to The Plaza’s reputation and serves countless New Yorkers and tourists every day is a whole other level of success. But Todd English is no ordinary chef. His first job in a professional kitchen was at the age of 15, after which he went on to graduate from the Culinary Institute of America with honors, apprentice in Italy, and become the Executive Chef of a restaurant in Cambridge, Massachusetts at the age of 25. After that, the accolades and awards poured in—including being named one of People Magazine’s 50 Most Beautiful People in 2001. 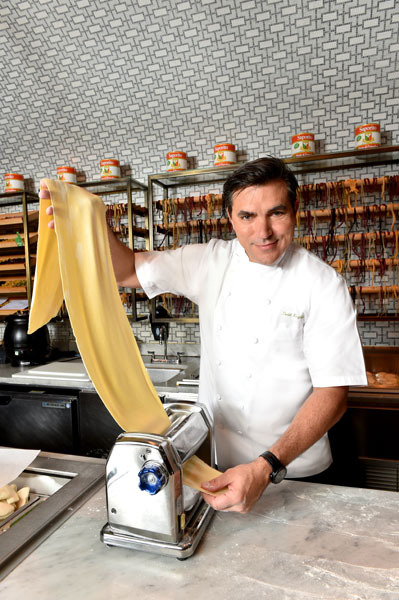 It’s been quite the ride for Chef Todd English, and it’s still going at lightning speed. 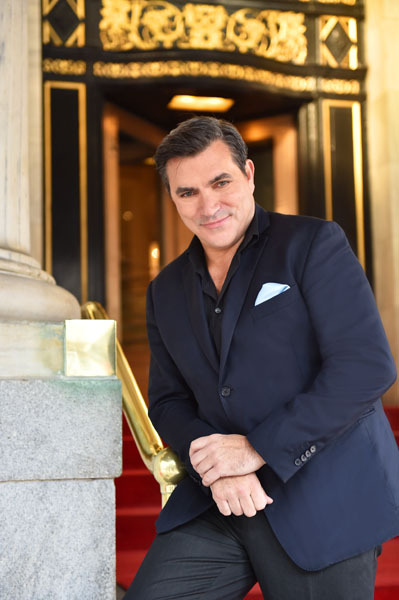 It’s no wonder, then, that we were more than a little excited to have the chance to sit down with English at his buzzing Todd English Food Hall and chat about his past, present, and future, while watching the charismatic man charm everyone in the room. Pamela Jacobs: Here’s a little known fact about you: You actually went to college on a baseball scholarship. Did you ever think you’d play professionally, or was being a chef always the plan? 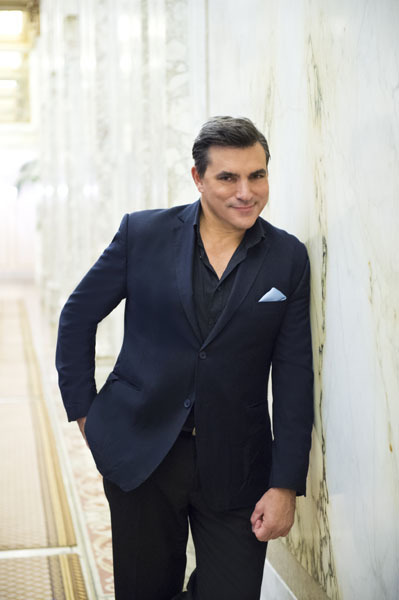 Todd English: Becoming a chef was never a plan, actually, because back then, it was not a profession that most people sought after. I always loved to cook, though, ever since I was a kid, and even had a garden of my own since I was a teenager. I grew up watching my Italian mother and Julia Child, and was always fascinated and passionate about cooking. PJ: When you first started cooking professionally, where did your influences come from? Were there specific places you’d been and/or other chefs that were significant to you from very early on? TE: From early on, I have always been incredibly passionate about traveling. I love to learn and experience new things from different cultures, which has played a huge part in what influences my culinary decisions. I take what I learn from each travel experience and try to put my own spin on it when I recreate the dish in my kitchen. I find it very important to maintain the origin of the dish, while enhancing and altering the flavors. I was also fortunate to be able to work with Julia Child when I moved to Boston, and she was truly an inspiration. PJ: Now you have restaurants all over the world—Vegas, Mexico, the Bahamas, throughout Florida and Massachusetts, and even Dubai. What unites them all, and makes them—no matter where they are or what they serve—unique to you and your brand? TE: I like to cook with a lot of flavor and love, and I want to always create a warm and fun dining experience. I always try to respect the authenticity of the international dishes on the menu, as well as adding a modern touch—essentially, a spin of the common classics using indigenous and seasonal ingredients. PJ: Of course, some of the most beloved of your restaurants (and certainly for our readers) are here in New York. Is cooking for New Yorkers different than for diners in any other places in the world? TE: New York is known for the amazing culinary variety it has. In this one city, you find the best cuisines from all over the world. When cooking for New Yorkers, it is incredibly important to be innovative and open to evolving with the times. Producing quality food is my main priority—no matter what state or country it is in—but New Yorkers have very high expectations (and rightfully so), so it is important to ensure we live up to that standard at all times. PJ: Are there certain stations in the Todd English Food Hall—or specific dishes within the nine stations—that are personal favorites of yours? TE: I don’t eat pasta like I used to, but a good plate of spaghetti will always be a favorite of mine. I take great pride in all of our dishes from the different stations, but with my Italian heritage, the pasta station is definitely one that I hold close to my heart. PJ: The Todd English Food Hall is an incredible culinary experience, and must have been a huge undertaking. How long had you been thinking about doing something like this, and how did it first come about? TE: The TE Food Hall was something I dreamt about for more than a decade, as I spent a lot of time traveling in Asia and Europe, and wondered why these types of markets did not exist in America. When the owners of The Plaza asked me to look at the space, I proposed the idea of a food hall market like I had seen in many places throughout the world—but one with an American sensibility. PJ: The Plaza is a classic, iconic New York institution. Did that play a big factor when coming up with specific plans for this concept? Meaning, do you think different choices would have been made had it been located somewhere else? TE: It may have been a bit different if the location was, let’s say, Brooklyn—or even Midtown. But in keeping with the classic style of The Plaza, we wanted the Food Hall to reflect the same timeless elegance and design. PJ: I’ve seen you give cooking demos several times, and you always seem to really enjoy it. Does that play a big role in who you are as a chef and a personality—teaching others and passing on your love of food? TE: Yes, certainly. I’ve always loved the theater of cooking and teaching and spreading the gospel of good food. PJ: It seems like you’ve done literally everything a professional chef can do: Restaurants around the world, television, multiple cookbooks, numerous charities, and an international Food Hall in what’s arguably New York City’s best hotel. Is there anything you’ve yet to do that we can expect from you? TE: I would like to continue in the education of food—especially the future of food and our health. We are what we eat, and so inevitably, I see chefs being involved in the well-being of everyone as much as doctors are. Designed by renowned architect Jeffrey Beers, with mosaic marble floors and dramatic dimensions, the Todd English Food Hall is a European-inspired specialty food market that’s, at its core, purely New York. It combines the best flavors and dishes of the world—with nine different food stations—with the sense of community that exemplifies this city, and offers something delicious for everyone. In addition to food favorites ranging from dumplings to oysters and tacos, there’s a 3,500-square-foot private dining room that can accommodate up to 175 people and features interactive chefs’ “action stations” for an immersive, all-encompassing edible experience (perfect for a holiday soirée). 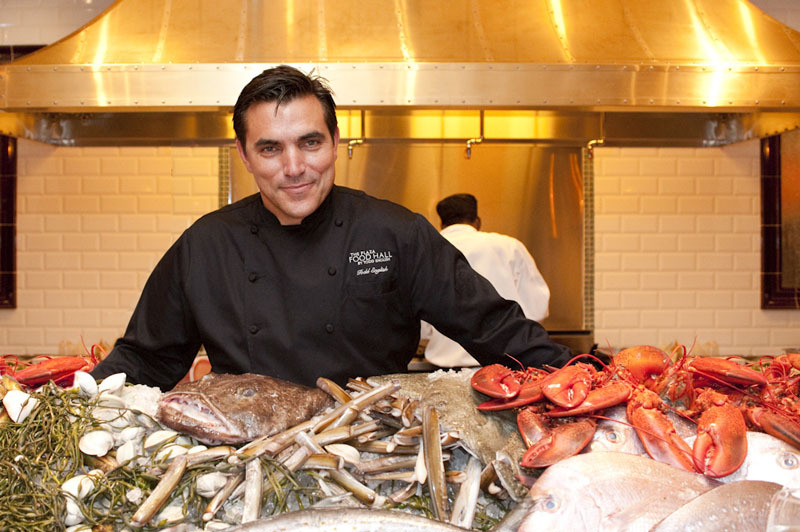 There’s also a grab-and-go market with items hand-chosen by Chef Todd English. This holiday season, the Todd English Food Hall will be offering special holiday menus. The Christmas Eve menu features such offerings as Butternut Lobster Bisque, Holiday Flatbread, and Crabmeat Stuffed Sole (with green bean “casserole”); the Christmas Day menu includes Traditional Country Pate, Rolled Ribeye “English Butcher” Style, and more. And for Christmas, they begin the holiday with the traditional Feast of the Seven Fishes on Christmas Eve, followed, of course, by a whole other feast the next day.